Want to buy a phone for Rs. 1500? Go for Lava KKT Ultra+ Union feature phone. Highlight of the device is the support for 22 vernacular languages. According to Lava, this is the first features phone to be launched in India with support to so many languages. Mumbai: Lava KKT Ultra+ Union comes with 2.4 inch. internal storage is 32 MB. Memory can be expanded up to 32 GB via micro SD. It comes equipped with 0.3 megapixel primary and there is no front facing camera on board. The handset supports Bluetooth connectivity. Other features are 3.5 mm headphones, dual SIM and FM radio. Battery under the hood is 1750 mAh capacity. 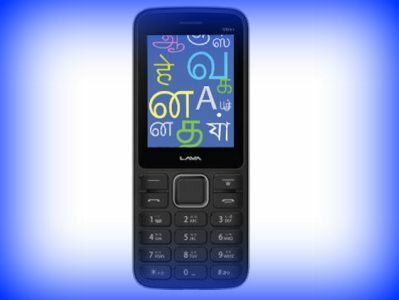 The new feature phone from Lava supports regional Indian languages such as Dogri, Assamese, Bengali, Hindi, Kannada, Guajarati, Manipuri, Malayalam, Sanskrit, Tamil, Telugu and Urdu. Apart from English, the users will be able to send SMS in all the 22 regional languages. The 1750 mAh battery of Lava KKT Ultra+ Union is expected to delivery up to 18 hours talk time. other features of this phone are the audio video player, 3.5 mm audio jack, auto redial and hands free mode. the handset will be soon made available in retail stores in India. Buyers can get one year manufacturer warranty. The device was revealed in an event in which the company revealed that the manufacturing unit in Noida is manufacturing one million phones per month. The handset is launched to support Make in India and Digital India initiative said Gaurav Nigam, Head Product, Lava International. People can express themselves in their own languages further added Gaurav Nigam. This entry was posted in Launches, Tech on March 30, 2016 by Rakesh.